Start off your visit on the 3rd (Sun): visit a coastal fixture at Baron Bliss Lighthouse. Get ready for a full day of sightseeing on the 4th (Mon): whizz through the canopy at some of the top local zipline courses and adventure parks. To find photos, maps, reviews, and other tourist information, read our Belize City journey planning site . Chicago, USA to Belize City is an approximately 8-hour combination of flight and bus. You can also do a combination of train, flight, and bus; or drive. Traveling from Chicago in June, things will get a bit warmer in Belize City: highs are around 88°F and lows about 78°F. Finish up your sightseeing early on the 6th (Wed) so you can catch the flight to Placencia. Start off your visit on the 6th (Wed): see some colorful creatures with a scuba or snorkeling tour. On the 7th (Thu), you'll have a packed day of sightseeing: stop by Treasure Box and then head off the coast to Laughing Bird Caye National Park. Plan my day in Placencia using traveler tips and tourist information provided by Inspirock. Placencia is very close to Belize City. Expect a daytime high around 88°F in June, and nighttime lows around 74°F. Finish up your sightseeing early on the 7th (Thu) so you can catch the flight to Caye Caulker. On the 8th (Fri), enjoy the sand and surf at The Split, take in the exciting artwork at Red Flower Gallery, then trek along The Estuary of Caye Caulker, and finally stop by Osprey Silver Jewelry & Boutique. To find maps, ratings, more things to do, and more tourist information, read our Caye Caulker route builder tool . Fly from Placencia to Caye Caulker in 1.5 hours. Alternatively, you can do a combination of bus and ferry. Expect a daytime high around 88°F in June, and nighttime lows around 78°F. Cap off your sightseeing on the 9th (Sat) early enough to catch the flight to San Pedro. Kick off your visit on the 9th (Sat): kick back and relax at Secret Beach and then see the vivid underwater world at Shark Ray Alley. On the 10th (Sun), you'll have a packed day of sightseeing: stop by 12 Belize, tour the water at your own pace with Kitexplorer San Pedro, and then relax and float downstream with a rafting and tubing tour. For ratings, photos, more things to do, and tourist information, go to the San Pedro road trip app . 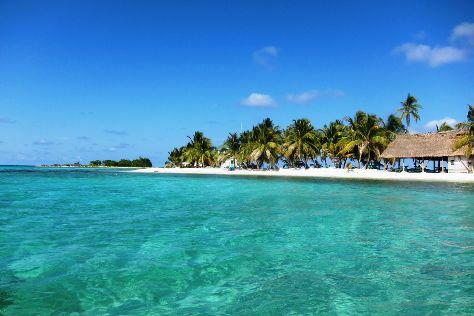 San Pedro is just a short distance from Caye Caulker. In June, plan for daily highs up to 88°F, and evening lows to 78°F. On the 11th (Mon), wrap the sightseeing up by early afternoon so you can travel back home.